Wow. This is a big book. I mean, seriously big. It’s 420 pages of letter-sized softback, absolutely crammed with information about one of the most famous cities in fantasy roleplaying – Pavis, City of Thieves, Gateway to Adventure. Let me be frank: I’m a fan. I have been ever since Pavis first saw the light of day back in 1983. And, since this freshly published brand new supplement for the HeroQuest fantasy roleplaying game hit my mailbox last week, I’ve become a fan all over again. This week and next, I’m going to review Pavis – Gateway to Adventure, and try to give some idea of why it’s such a special book. 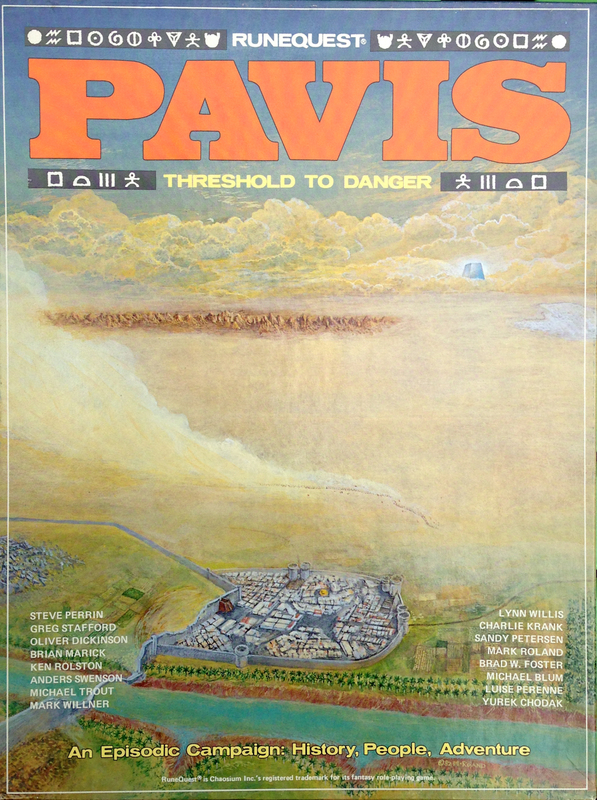 This week, I’ll consider the history of the city of Pavis as a roleplaying game product, and give a high-level overview of what the new supplement contains; next week, I’ll look into the book in much more detail, and provide a chapter-by-chapter breakdown. So what is Pavis, and why should you care? Well, if you’re a fan of the ancient fantasy world of Glorantha, the invention of RPG and fiction writer (and sometime shaman) Greg Stafford, then you’ll know all about Pavis already. But if you’re not – then prepare yourselves for a treat. Because whether you’re a roleplayer, or a fan of fantasy fiction with a love of well-crafted worlds, meticulous cultural detail, and awesome fantasy cities, Pavis – Gateway to Adventure might just be for you. Most fantasy worlds owe something to Tolkien, or mediaeval Europe, for their inspirations: their architecture, atmosphere, bestiaries, technologies. Not so Glorantha. Glorantha is a world firmly in the ancient mould: a bronze age world of hoplites and phalanxes, of centaurs and squabbling gods, of papyrus boats and world spanning empires determined to civilize the barbarians whether they like it or not. But it’s more than that: imagine a fantasy world inspired not by J R R Tolkien, but by Joseph Campbell, where the hero path is real, where individuation, transcendence, and apotheosis on the way to herodom are part of the world. People have been roleplaying in Glorantha for over thirty years. In its earliest days, it was the progenitor of the popular percentile system now known as Basic Roleplaying, but then called RuneQuest, which gave birth to games like Call of Cthulhu, Stormbringer, Hawkmoon. RuneQuest still exists, and you can still play in Glorantha using those rules – indeed, the sixth edition is imminent as we speak. But the game system which holds the Campbellian chalice today is HeroQuest, published by Moon Design Publications and written by RPG guru and author Robin D Laws; it’s a fabulous story-telling roleplaying game, closely tailored for the heroic, transcendent, games which Glorantha provides. And it’s HeroQuest for which Pavis – Gateway to Adventure is written. The city of Pavis has a Near or Middle Eastern feel. It’s a city of adobe and mud-brick, of heat and dust and swords and sandals, of priests atop ziggurats, of wild nomads lurking in shadows from the Wastes. But Glorantha is also a magical world, and Pavis lies in the shadow of the ruins of a vast and ancient metropolis, whose heyday was many centuries ago, with walls built by giants and once ruled by a god – the city of Old Pavis, now known as the Big Rubble. This is where Pavis starts getting really special: not only is it a cool and unique setting in its own right, but it lies on the very threshold of what’s possibly the biggest, baddest, and most spectacular adventuring location in the whole of roleplaying. The Big Rubble is miles across within its giant-built walls, and inhabited by trolls, dragonewts, elves, and chaos beasts galore. Hard-bitten humans still eke out an existence in the more substantial ruins, but vast tracts are lone and level wasteland, assemblies of rubble, ancient underground repositories of treasure, death, and unspeakably valuable lore… What more do you need from a fantasy roleplaying setting? As I mentioned above, the city of Pavis was first treated in a game supplement back in 1983, in a beautiful boxed set featuring histories, scenarios, and maps. It was closely followed by its companion set, Big Rubble – The Deadly City. At the time, the twin publications set a new standard in quality for roleplaying games – they became instant classics, and I’m sure there are countless gamers out there like me, who remember their first foray into Balastor’s Barracks, or the Puzzle Canal, or in the terror-stricken tunnels beneath the Devil’s Playground. 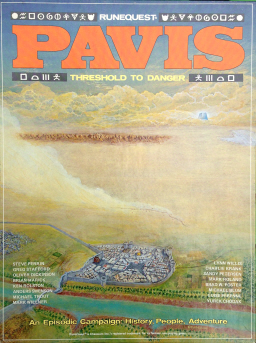 Ten years later, in the “RuneQuest Renaissance” of the early 1990s, Pavis was visited again, this time in supplements which focused more on the lands around the great and ancient city – River of Cradles, Sun County, Shadows on the Borderland, and Strangers in Prax gave us reason to venture out into the deserts and wastelands again, and where else would be the base for our adventures but Pavis itself? Since that time, Pavis has been the subject of many fan-created articles and adventures on the web and in print, but not until now has there been a treatment for the new game system which is now the official rules set for adventuring in Glorantha in its Third Age since the rising of the sun – the HeroQuest 2nd edition rules. Three years ago, in 2009, writer Jeff Richard collaborated with Glorantha creator Greg Stafford to produce Sartar – Kingdom of Heroes, the first Gloranthan supplement for the new second edition of the HeroQuest rules. In one fell swoop, it set a new standard for Gloranthan publications, and was also a major milestone in RPG publishing: a lavish, 378-page treatment of the uplands of the Kingdom of Sartar, to the west of the wastelands of Prax and the city of Pavis, detailing its religions, cultures, histories, and peoples in absolutely unprecedented detail. It provided maps, snippets of literature and compendia, encounters, and a full campaign. It’s still perhaps my favourite single RPG book – and it now has a strong contender. It was followed in 2010 by the Sartar Companion – additional detail about the towns, cities, temples, and cultures of the lands of Sartar, new encounters, and excellent adventures. Together, these two volumes could easily provide years of action-packed adventure. Cue today: April 2012, and the release of Pavis – Gateway to Adventure. Physically, the book is similar to the two previous Sartar books. It’s a high quality, letter-sized paperback, with colour front and back covers and a predominantly black and white interior with numerous colour plates. And it’s 416 pages long. That’s right: it’s a full-size RPG supplement that’s over an inch thick. And, given that the HeroQuest game system does not rely on pages and pages of stat blocks and the like, that’s almost all pure descriptive content. There’s an unbelievable amount of information in this book. So what do you get in Pavis – Gateway to Adventure? Well, first up, if it’s a roleplaying game you’re looking for, this isn’t standalone: it’s a supplement for the HeroQuest game, and also requires the Sartar: Kingdom of Heroes supplement to play. Of course, that’s if you’re playing HeroQuest: if you want to use this most wonderful of fantasy cities in your favourite system, whether that’s RuneQuest, Basic Roleplaying, or even systems like FATE (one of my favourites) or something else entirely, then you can use the book on its own. 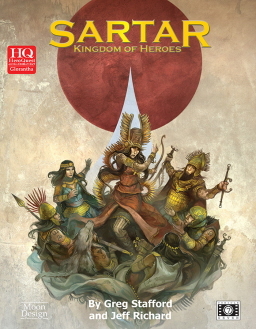 Personally, I’d also recommend Sartar: Kingdom of Heroes in that case, to get the most out of the book’s cultural setting. Beyond that, Pavis – Gateway to Adventure is a treatment not just of the City of Thieves itself, but also a presentation of the entire of the land of Prax, the great desert-like wasteland which surrounds the city and its ruinous Big Rubble neighbour. The material here allows you to play in the city itself, and all the way up and down the River of Cradles, Prax’s main river, and into the wastes of Prax. I should mention that the city of Pavis remains the book’s heart: descriptions of the land of Prax and the River of Cradles are from the point of view of the citizens of Pavis; you won’t find rules here for playing the nomads and beast people of Prax, or their religions and magics – except as foes and adversaries to be encountered when travelling their lands. But what it does give you is full details of how to create and play Pavisite characters – whether refugees from the lands of Sartar, natives of the city, the Rubble, and the river valley, or even citizens and soldiers of the Lunar Empire, the vast Romano-Greco-Mesopotamian-inspired civilization which currently holds the lands of Sartar and Pavis in thrall. 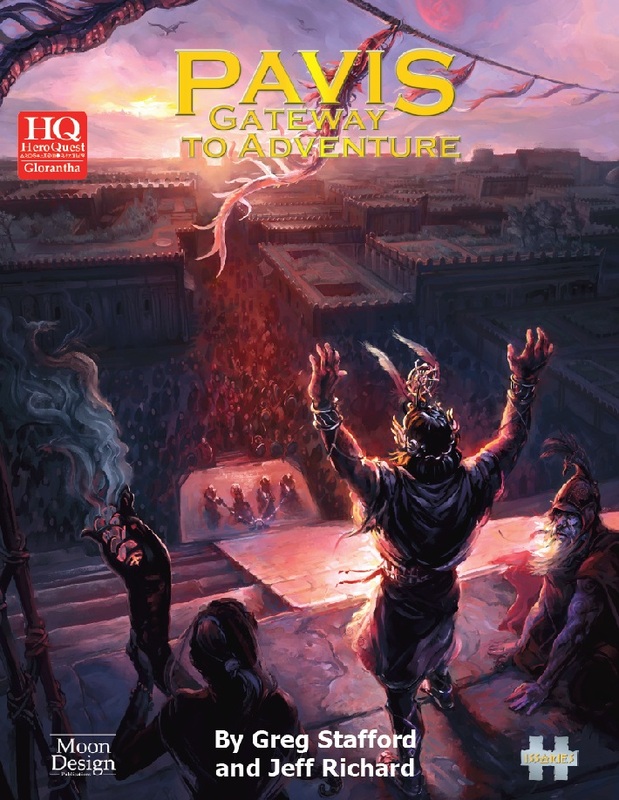 Pavis – Gateway to Adventure is a 416-page paperback supplement for the Glorantha setting and HeroQuest game, price $59.99 from Moon Design Publications. Sarah Newton is a writer of RPGs and genre fiction. The second part of her review of Pavis – Gateway to Adventure can be found here. Marvelous! I bought both the BIG RUBBLE and PAVIS boxed sets decades ago, and — like everyone else who did so — yearned for more. Not sure how I missed the release of both Sartar: Kingdom of Heroes and Pavis, but I’ll rectify that right now. Thanks for pointing me towards them! Fans of Pavis may well have read The Complete Griselda by Oliver Dickinson. If not I highly recomend this collection of short stories that occur in and around Pavis.